"Game of Destiny" is a book by Mario Dos Ventos, and yes, it's good. If you're looking for a Lenormand deck, The Austrian deck Papa Newt mentioned is great, as well as the others offered here. They're all traditional old Lenormands, the best for both learning and reading. 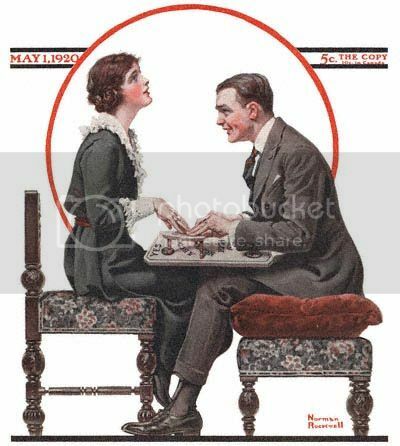 I just thought I'd post this here to show how peoples' ideas about the Ouija have changed - it's a Norman Rockwell Saturday Evening Post cover! Fantastic! Thank you, Miss Aida - looking forward to that! These booklets really are excellent. Are more titles still planned? Fish are submerged and they seem to do fine. Miss Cat, would you know if they're using Pi Yao in Bay Area conjure practice as well? Gambling luck is one of Pi Yao's specific functions, it just seems like a great fit. I'm just happy this site exists. It's been crazy helpful! Will this be back in stock at some point? It looks powerful. I've thought about doing the same thing...those little rare earth magnets are strong. I suspect it's like anything else. Total sobriety is sound policy. A little bit of alcohol can also be good, and can actually enhance things. Too much just makes a mess. Worded my post badly, I should have said Saints, not deities. *smacks head* Apologies. But you've answered my question, the Saints would operate the same way. Thank you! If you're working on somebody with a name like "Jim", the odds are more favorable for signs, but what about uncommon names? Would an "almost the same" name count as a sign? What about a surname? I've read that in Tibetan medicine, ALL the metals have benefits. I think the three metal bracelets are believed to have a synergistic effect, moreso than a simple copper bracelet. Whatever the case, they're beautiful...you can't lose. Thanks, MaryBee! That was quick. Sounds like you do it the same way I've been doing it, so it's permissable...but I'll switch up and see what happens. It's worth a try. The Dos Ventos book? It's great...besides card meanings, etc., it's got some Brazilian magic. Somewhat related: Are there any "picky" deities in Hoodoo, who don't work well with Eastern deities? Thanks...that's been my instinct so far..."if it ain't broke, don't fix it." Thanks so much, Joseph! I think I can pull off the birthday candles...if there's any problems I'll definitely send it. It's worth whatever I have to do to keep it going! I don't get the warnings - I'm using IE at the moment with McAfee virus protection. Not saying that's better or worse, just offering the information in case it can help you guys figure this out. Lots of good signs the first day or two, but gradually tapering off. The fourth day was no-go for me too but I'm keeping CajunBarbie's post in mind...mine could take awhile to manifest so I'm not giving up on this. Mine are working so well where they are, I really don't want to move them. I've been needing to clean them a little more than monthly due to the dust issues here, but maybe they like the extra attention.